Whether you’re settled into your home, just purchased one, or are still in the design process, Weston Dean has plenty of inspirational directions to take your vision to new heights. Our Vision Views page provides customers and homeowners alike with design, decorating, and remodeling ideas for their San Antonio home. We’ve broken down each style category below to provide you with plenty of ways to conceptualize how each could fit with your home or home-to-be. Traditional style homes are thoughtfully constructed with floor plans allowing for modern living, but without modern-looking design features. This style is highlighted by large windows with full plate glass, horizontal wood siding or brick, flat and/or metal roofs, and clean lines throughout. Think of colonial homes when you think of Traditional style influences. Pillars on the front of the house are a great addition and crown molding sets off the feel of a Traditional home. On the opposite end of the spectrum, Hill Country Contemporary style blends clean lines with rustic materials. 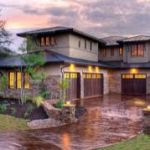 Also known as Texas regional, this type of design often features exposed beams, stone, earth, and stucco accents, regional materials, and low pitch metal roofs with an overall emphasis on making contemporary features out of local, rustic provisions. Hill Country Contemporary homes tend to have open floor plans, vaulted ceilings, and clean, square lines. Texas Country style is slightly less sophisticated than Hill Country Contemporary but makes up for it in charm. This type of home tends to have more wooden features on the outside of the home while still incorporating plenty of natural wood and stone materials on the interior. General characteristics such as stone or wood interiors and low pitch metal or composition roofs help set off a modern country feel. Spanish Revival style architecture has become increasingly popular in San Antonio, and Weston Dean is no stranger to this type of design. General features like thick walls, recessed windows, exposed beams, red barrel roof tiling, and more are highlighted by details such as arches, stucco walls and exteriors, terracotta tile, rich fabrics and woodwork, and wrought iron railings and fixtures. This type of home is easy to visualize: think of a hacienda-style property with tans and reds as the major color palette and plenty of rich fabrics, detailed tiles, cozy rooms, and archways. European architecture is known for very high pitched, steep roofs, divided pane windows, slate roofs, hinged French doors leading to balconies or patios, rounded entryway towers topped with cone-shaped roofs, and masonry exteriors. Tudor homes exhibit several of the qualities of Weston Dean’s European style homes. During the last 100 years, American architecture has enjoyed a renaissance of European style homes and features, particularly in Dallas, San Antonio, and Houston. If you’re simply looking to upgrade what you currently have or make a few tweaks to your home, Weston Dean offers many, many ways to customize your place. Kitchens can be redesigned to include pull-out trash bins, upgraded appliances, stone or tile detail on granite islands, glass cabinet doors, and so on. Bathrooms can be improved by adding rubbed bronze fixtures, barrel ceilings over the tub, speakers for an intercom or music entertainment, linen closets with clothes hampers, a jetted bath tub, and more. Outdoor living spaces can have a kitchenette, fire pit, bench seats, or wood truss ceiling installed. For increased energy efficiency, tankless water heaters, vinyl windows, recessed lighting, and improved insulation can help make an impact. For the exhaustive list of custom changes Weston Dean offers, take a look at their PDF here. 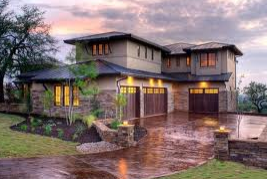 Let Weston Dean build your home customized with the features and architectural style you’ve always dreamed of. Their Vision Views provides homebuyers and owners plenty of inspiration to mix with their own ideas.